New Delhi, 18 July 2017: The Department of Animal Husbandry, Dairying and Fisheries (DADF), Ministry of Agriculture and Farmers Welfare is implementing a Central Plan Scheme on ‘Blue Revolution: Integrated Development and Management of Fisheries’ with ‘National Scheme of Welfare of Fishermen’ as one of the components. 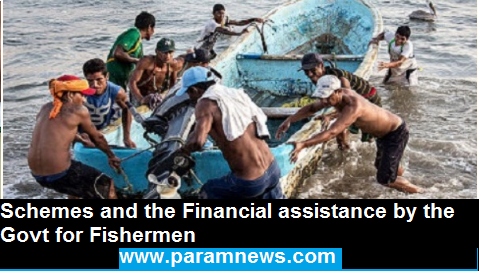 The National Scheme of Welfare of Fishermen provides financial assistance to fishers during the lean fishing season/fishing ban period especially for fishermen who do not have their own fishing boats. In addition, financial assistance is also provided for construction of houses for fishers and creation of other basic amenities such as drinking water facility & community halls. Besides, insurance coverage for fishers is also provided under the scheme. The scheme also aims for an integrated development and management of the fisheries sector covering inland fisheries, aquaculture, marine fisheries, mariculture, cage/pen culture and creation of fisheries infrastructure through central financial assistance towards sustainable livelihood to fishermen. (i) Development of Inland Fisheries and Aquaculture, (ii) Development of Marine Fisheries, Infrastructure and Post Harvest Operations, (iii) National Fisheries Development Board (NFDB) and its activities, (iv) National Scheme of Welfare of Fishermen, (v) Strengthening of Database and Geographical Information System of the Fisheries Sector and (vi) Monitoring, Control and Surveillance (MCS) and other need based interventions. today in a written ryeply to a Lok Sabha question.